An essential ingredient in my Blood Orange Mezcal Negroni, Blood Orange Cordial is so quick, easy, and inexpensive to make, why spend the time and money buying it? 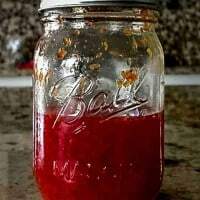 Homemade blood orange cordial is easy, quick, and cheap. It's a perfect cocktail ingredient, but you can use it in mocktails (with sparkling soda), syrups, etc. Add water and sugar to a small sauce pan on high heat. Bring to a boil, and stir until dissolved. Remove from heat. Add the zest and juice of the 2 blood oranges. Stir. Pour into a non-reactive (glass) jar.